If you’ve been in tech for a while, you likely know that Microsoft jobs have long been some of the most sought-after in the industry. From the early days of recruitment ads in Network World magazine to these unbelievably cheesy videos made in 2008, Microsoft has long been on the hunt for top-tier talent to fill their most important roles. Location flexibility. With offices in 109 different countries, Microsoft jobs exist all around the world. Top-notch healthcare. Medical, vision, and dental care for you and your dependents. Plus, physician house calls and on-campus health screenings to make your regular check-ups that much more convenient. Time away. A generous PTO policy plus respectable maternity and paid parental leave policies. Plus all the fun stuff. Gift matching, on-campus gyms, cafeterias, dry cleaning, even a bank. Not to mention the employee discount on Microsoft products. Well, the compensation of course. Microsoft has never shied away from offering top-dollar compensation packages to lure top talent. And that’s exactly what we’re going to discuss here today. This post reveals the four top paying Microsoft jobs according to Paysa data. You’ll learn which roles command top-dollar salaries and what it takes to qualify for the positions. But first, let’s walk through why working at Microsoft may be the greatest opportunity in all of tech. What Makes Microsoft Such a Great Place to Work? For many people working in tech, the idea of climbing the corporate ladder with one company through your entire career seems a bit antiquated. According to the Bureau of Labor and Statistics, average employee tenure dropped in 2016 to 4.2 years. Retaining talent is tough, but one of the ways Microsoft does it successfully is by providing a tremendous amount of internal growth opportunity. Microsoft has a very structured career roadmap for each of its roles. Like many companies, you can earn the opportunity to develop into leadership positions, or you can continue to elevate your career as an individual contributor. With that level of flexibility to design your own career, it’s no surprise that Microsoft has no trouble retaining key talent. With over 100,000 employees worldwide, it’s hard to imagine a company as big as Microsoft maintaining their company culture. On June 13, 2016, Microsoft announced the acquisition of LinkedIn for the ripe sum of $26.2 billion. It was the largest tech acquisition in history, sending shockwaves across the industry and solidifying Nadella’s place in the Microsoft history books. While the details are still somewhat ambiguous on how these two tech giants will partner together, the partnership holds a tremendous amount of potential that should be alluring to top tech talent. LinkedIn has over 500 million members providing data on their professional activity. Microsoft has a suite of tools — including Dynamics and the recently launched Teams — that one can imagine would be dramatically enhanced by LinkedIn’s data. What will come of the partnership remains to be seen, but in the meantime, the acquisition stands as a beacon of Microsoft’s focus on innovation — a welcome sign for prospective employees. 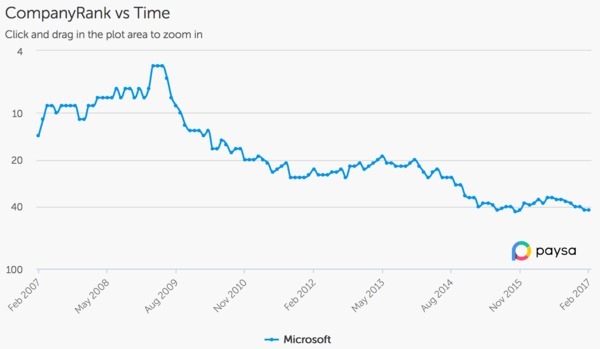 According to Paysa data, Microsoft’s CompanyRank has slipped a bit over the past few years from its peak at the #5 spot in 2009. As of February 2017, Microsoft was ranked in the #42 position. Now you might be thinking, “Yikes, that seems like a pretty dramatic, negative shift.” But let’s put things in perspective. With that in mind, #42 out of 198,000 doesn’t seem all that bad, does it? In fact, that puts Microsoft in the top .02 percent of companies considered by the algorithm. Needless to say, that means they have no problem attracting and retaining top-tier talent from across the tech industry. Microsoft CompanyRank from 02/07 to 02/17, per Paysa data. So, we know Microsoft has a lot to offer their employees in terms of opportunity, culture, benefits, and perks. But how about compensation? 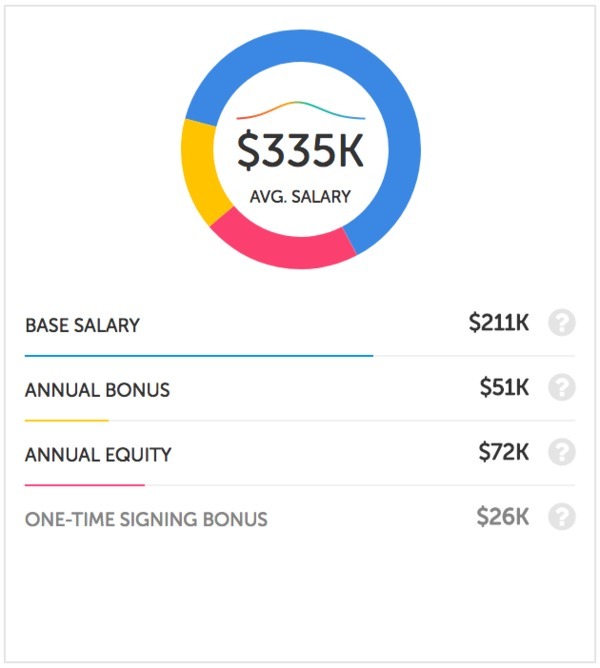 Paysa has gathered salary data from 79,000 profiles to find that the average market salary at Microsoft is a whopping $254,000 per year. Average market salary for Microsoft employees, per Paysa data. A base salary ranging from $110,000 to $217,000 per year. Annual bonus ranging from $17,000 to $67,000 per year. Annual equity ranging from $19,000 to $89,000 per year. A one-time signing bonus ranging from $9,000 to $34,000. Compare that to the Google salaries compiled in this Paysa blog post, and you’ll see that Microsoft employees earn — on average — 13.45 percent more than employees at Google. Let’s take a look at the four Microsoft jobs with the highest earning potential. According to Paysa data from 593 profiles, principal engineering managers at Microsoft earn an average market salary of $464,000. Average salary for a principal engineering manager at Microsoft, per Paysa data. A base salary ranging from $213,000 to $353,000 per year. Annual bonus ranging from $46,000 to $124,000 per year. Annual equity ranging from $55,000 to $152,000 per year. A one-time signing bonus ranging from $14,000 to $41,000 per year. Directors of product management at Microsoft can expect to earn an average salary of $382,000 per year according to Paysa data. Average salary for a director of product management at Microsoft, per Paysa data. A base salary ranging from $191,000 to $292,000 per year. Annual bonus ranging from $46,000 to $121,000 per year. Annual equity ranging from $35,000 to $81,000 per year. 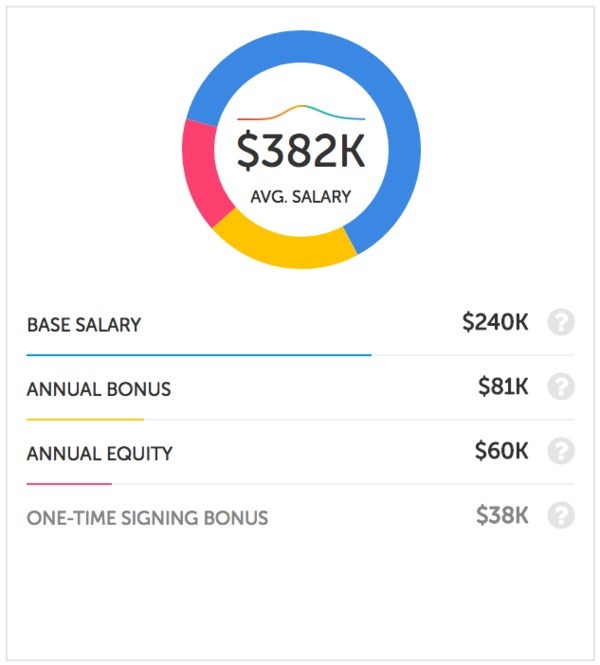 A one-time signing bonus from $21,000 to $57,000. Here’s an individual contributor role with some serious earning potential. According to Paysa data, software architects at Microsoft can expect to earn an average salary of $335,000 per year. Average salary for a software architect at Microsoft, per Paysa data. A base salary ranging from $203,000 to $220,000 per year. Annual bonus ranging from $46,000 to $56,000 per year. Annual equity ranging from $63,000 to $81,000 per year. A one-time signing bonus of $22,000 to $31,000. Finally, another leadership role that Microsoft employees can aspire to grow toward. Principal application development managers earn an average salary of $371,000 per year according to Paysa data. Average salary for a principal application development manager at Microsoft, per Paysa data. A base salary ranging from $160,000 to $279,000 per year. Annual bonus ranging from $28,000 to $110,000 per year. Annual equity ranging from $25,000 to $153,000 per year. A one-time signing bonus ranging from $10,000 to $61,000. So as you can see, Microsoft offers the entire package to their employees. In addition to a long-standing company culture, spectacular benefits and perks, and a career ladder with no ceiling, the company also offers some of the most competitive compensation packages on the market. If you’re interested in exploring open jobs with Microsoft, check out the Paysa job search today where as of publication, there are over 1,000 open Microsoft jobs for your consideration. 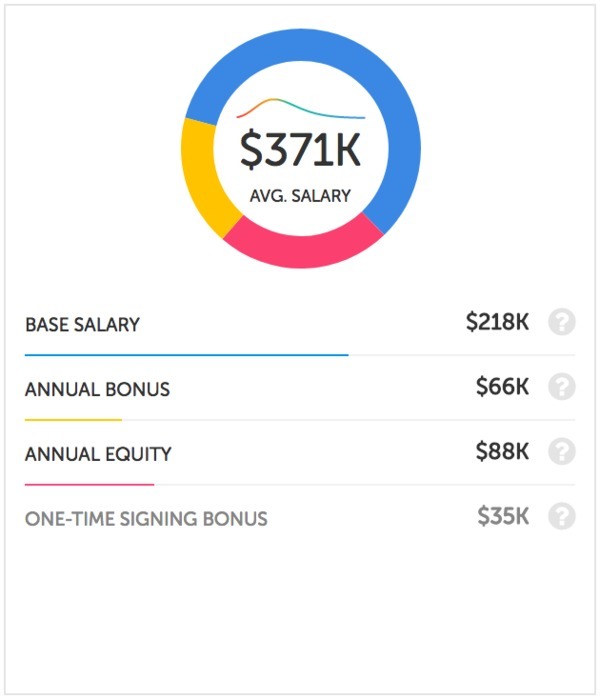 And to get a feel for the top-paying jobs at any company, access Paysa’s extensive database of salary information. 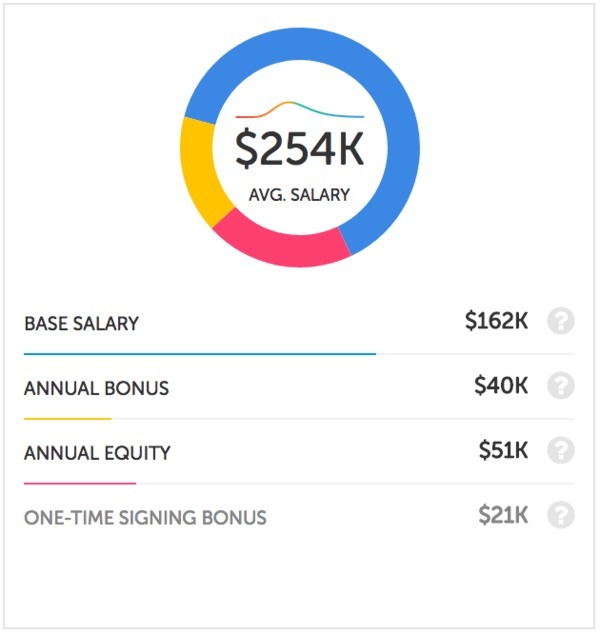 You can even create a profile to learn if you’re making the kind of money you deserve for your level of talent.